Prizes: TEN (10) GRAND PRIZES: A “Beauty Basket” Prize Package consisting of one (1) $100 J.Crew gift card; one (1) $50 Spafinder gift card, one (1) Peter Thomas Roth Super Trio; one (1) Best of Kiehl's Set; one (1) Glamsquad Untamed Texturizing Finishing Spray and one (1) Glamsquad Iconic Blowout Lotion. Approximate Retail Value (“ARV”): $306. 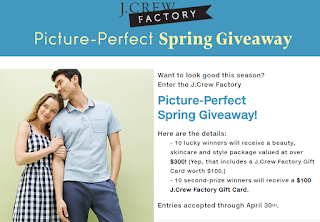 TEN (10) SECOND PRIZES: A $100 J.Crew gift card. ARV: $100.